The Haast Pass (Māori: Tiori Pātea), a mountain pass in the Southern Alps of the South Island of New Zealand, takes its name from Julius von Haast, a 19th-century explorer who also served as Provincial Geologist for the Provincial government of Canterbury. 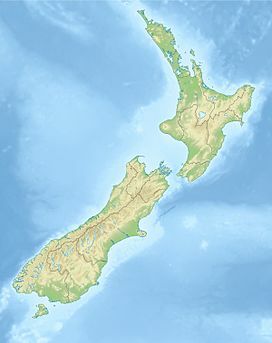 Māori used the pass in pre-European times. Fantail falls, in the Haast pass. The Haast Pass rises to a height of 562 metres above sea level at the saddle between the valleys of the Haast and Makarora Rivers. As such, it is the lowest of the passes traversing the Southern Alps. No settlements exist on the Haast Pass road between Haast and Makarora. The road passes through predominantly unmodified beech forest. The pass itself lies within the limits of Mount Aspiring National Park and forms part of the boundary between Otago and the West Coast. Wikimedia Commons has media related to Haast Pass. ^ Churchman, Geoffrey B; Hurst, Tony (2001) [1990, 1991]. The Railways of New Zealand: A Journey through History (Second ed.). Transpress New Zealand. p. 193. ISBN 0-908876-20-3.